Exhibitions | JONAH BRUCKER-COHEN, PH.D. 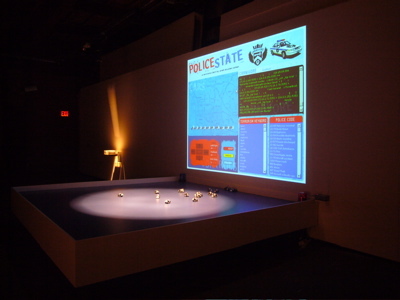 Exhibitions – JONAH BRUCKER-COHEN, PH.D.
“PoliceState” installed at “Source Code“, Eyebeam Center for Art & Technology, May 31 – August 11, 2007, NY, NY. Featured in the “Make Something Big” Contest, Little Bits, May 2013. 2nd prize in the “Build a Better Piggy Bank” Contest, FutureAdvisor, May 2013. Social(dis)order, Glassell Gallery, Louisiana State University (LSU), August 30 – October 7, 2012, Baton Rouge, Louisiana, USA. Whitney Museum of American Art: Artport, February 2012, NYC, NY, USA. April 28, 2011, Online Art Exhibition. October 2, 2010 â€“ December 4, 2010, Otis College of Art and Design, Los Angeles, CA. September 25-26, 2010, NY, NY. May 22, 2010, NYC, NY. OUT and ABOUT, and ALWAYS ON. May 15, 2010, NYC, NY. March 13, 2010 March 14, 2010, Newcastle, UK. November 12 to December 16, 2009. May 25, 2009, Great Stony, Essex, UK. TechPerformance Pavillion, ARCO Art Fair, Madrid, Spain. Galerie De Meerse, Hoofddorp, Amsterdam, Netherlands. Haus De Culturen De Welt, Berlin, Germany. BLIP! @ Telefonica Foundation Gallery, Lima, Peru. Enter 3 Festival, Web 2.0 Generation, Czech Academy of Sciences, Prague, Czech Republic. ArtLabs: Connectivity Show, Sibiu, Romania. Interactive Media Arts Laboratory (IMAL), Brussels, Belgium. Computer Fine Arts Exhibition @ Haifa Museum, Israel. Offload Festival, Online exhibition, Bristol, UK. 9/11/07 @ Washington College, Chesterton, MD, USA. 8/07 @ Web Biennial 07, Istanbul Contemporary Art Museum, Istanbul, Turkey. 6/5/07 @ Eyebeam Center for Art and Technology, NYC, NY, USA. 5/31/07 – 8/11/07 @ Eyebeam Center for Art and Technology, NYC, NY, USA. Edith Russ Haus For New Media Art, Oldenburg, Germany. 4/5/07 – 4/16/07 @ 10 Years Running: Parsons MFADT, Chelsea Art Museum, NY, NY. 3/30/07 – 6/30/07 @ Labcyberspaces Project, LABORAL Centro de Arte y Creacion Industrial, Gijon, Spain. 1/21/07 – 4/22/07 @ Contemporary Museum, Baltimore, MD, USA. Royal Dublin Society, Ballsbridge, Dublin, Ireland. Location One, New York, NY. Fort Worth Modern Art Museum, Dallas, Texas, USA. 9/16/06 @ OBORO, Montreal, Canada. Student Center, Harford Community College, Bel Air, MD, USA. 10/14-12/11/05 @ Glowlab Open Lab, Art Interactive, Boston, MA, USA. 10/26/05 @ Handheld Event, New York, NY, USA. Mardyke complex, , Cork, Ireland. 9/19/04 – 1/30/05 @ Phonorama, ZKM, Karlsruhe, Germany. 10/29/04 @ Art Futura 2004, Barcelona, Spain. 10/21/04 – 11/6/04 @ Democracy is FUN, WhiteBox, NYC, USA. 10/5/04 @ Microwave Festival, Hong Kong, China. 9/21/04 – 10/3/05 @ Villette Numerique, Parc de la Villette, Paris, France. 8/22/04 @ Mor Festival 2004, Charleville Castle, Tullamore Co. Offaly, Ireland. 7/23/04 @ Garage Festival 2004, Straslund, Germany. 7/22/04 @ Inifite Fill Show, Foxy Production Gallery, NYC, NY, USA. 5/22/04 @ PEAM, Ecoteca, Pescara, Italy. Ars Electronica 2004, 9/2-7/04, Linz, Austria. 5/14/04 @ Vooruit, Gent, Belgium. 5/7/04 to 6/7/04 @ Artist Network, NYC, NY, USA. 4/15/04 @ Oboro Gallery, Montreal, QC, Canada. 4/21/04 @ Images Festival, Toronto, Ontario, Canada. 3/26/04 – 4/18/04 @ Oslo/Trondheim, Norway. 3/20/04 @ ICA, London, UK. 3/10/04 – 4/1/04 @ ICA, Digital Media Center, London, UK. 2/19/04 – 4/6/04 @ Huddersfield, UK. Doncaster Museum & Art Gallery, Doncaster, UK. 2/11/04 @ The Digital Hub, Dublin, Ireland. 2/10/04 – 3/5/04 @ Sheppard Fine Arts Gallery, Reno, Nevada, USA. 1/17/04 – 4/4/04 @ Yerba Buena Museum, San Francisco, CA, USA. 1/31/03 – 2/6/04 @ Berlin, Germany. 11/27-29/03 @ BALTIC (Newcastle) & Limehouse (LONDON), UK. 10/23-24/03 @ E-culture Fair @ Paradiso, Amsterdam, The Netherlands. DEAF (Dublin Electronic Art Festival), Dublin, Ireland. 10/11/03 @ JavaMuseum, Cologne, Germany. Haunted, City Arts Centre, Dublin, Ireland. 6/2/03 – 7/03 @ ArtPort Gate Page, The Whitney Museum of American Art, NYC, NY. 5/13/03 @ P2P_.EDU, Featured Artist, MicheleThurz.com. 5/10/03 @ Digital Visions, University of British Columbia, Vancouver, BC, Canada. 3/18/03 @ Turbulence.org Artist Spotlight, NYC, NY. 3/7/03 @ Re:Code, “Software Art”, DVD, Brisbane, Australia. 3/15/03 – 6/10/03 @ Exhibit 2: Mobilise @ The Digital Hub, Dublin, Ireland. 2/25/03 – 3/9/03 @ Dutch Electronic Art Festival (DEAF03), Rotterdam, The Netherlands. 12/18/02 – 3/18/03 @ Exhibit 1 @ The Digital Hub, Dublin, Ireland. Dec 5 – 25 @ “20/20” show, Temple Bar Gallery, Dublin, Ireland. Sept 20-22nd @ Darklight Film Festival, Dublin, Ireland. Sept 7-12 @ Ars Electronica, Linz, Austria. June 4-10th @ Cybersonica, ICA, London, UK. March @ Irish Museum of Modern Art, Dublin, Ireland. February 5-24 @ Transmediale 02, Haus De Kulturen de Welt, Berlin, Germany. October @ Interface Explorer Conference, Vienna, Austria. Collaborative musical composition with a telephone. Dec @ Soundtoys.net Exhibition, London, England.